During Holy Week, Christians commemorate the Passion of Christ. As the faithful, on Palm Sunday, we remember and dramatize Christ’s triumphal entrance into Jerusalem on a donkey. In Jesus’ time, a huge crowd assembled, put their cloaks or branches on the ground, and waved palm branches, acclaiming Christ as the King of Israel, the Son of David. 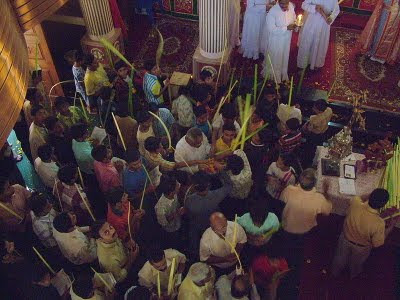 We now wave our palm branches and sing as the priest enters the church. With that said, I thought I might continue the green theme, with it being Palm Sunday and all. I decided to go with a salad. Yes, a big beautiful healthy green salad. Don’t get used to this, next week I will be back with meat and potatoes. 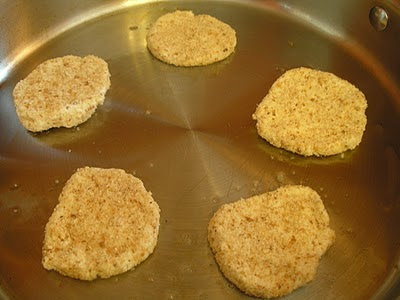 In a small bowl, mix the bread crumbs with salt and pepper. 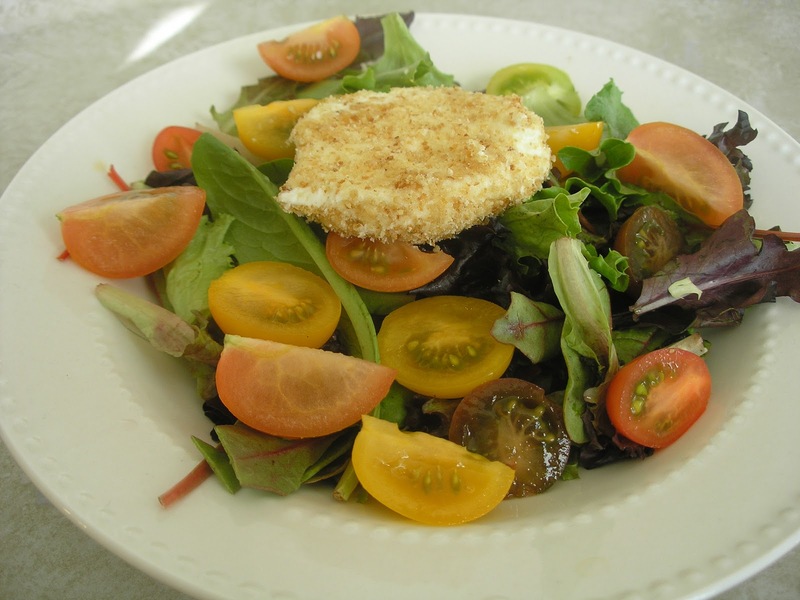 Brush the goat cheese disks lightly with the remaining 1/4 cup of the oil and season with salt and pepper, to taste. Coat the cheese on all sides with toasted bread crumbs. Fry in a frying pan until warmed through, about 5 minutes. I found these heirloom tomatoes at Trader Joe’s. They were calling to me. 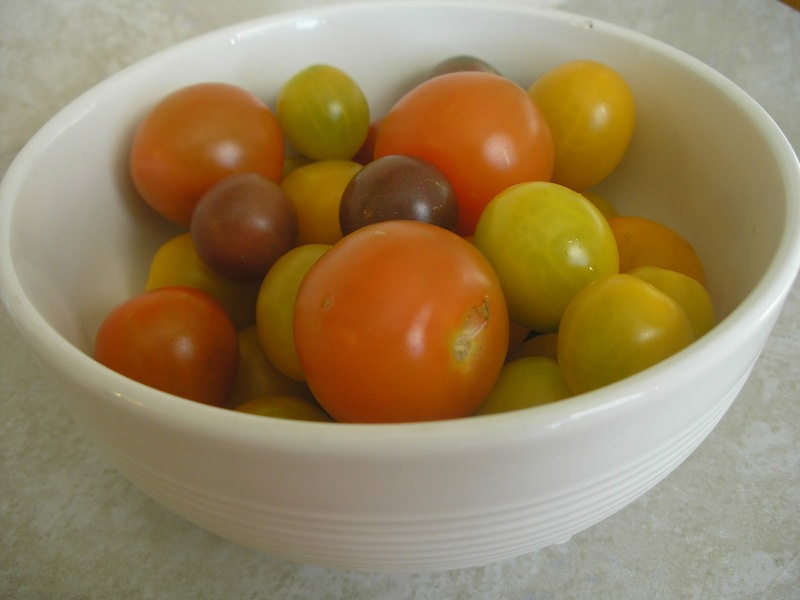 Toss the heirloom tomatoes on the salad. 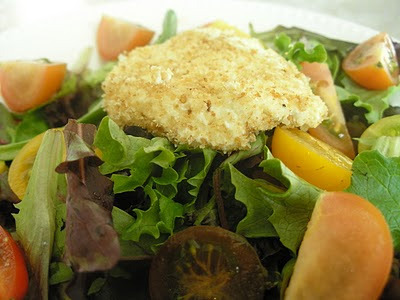 Carefully, divide the goat cheese rounds on top of each salad. Drizzle with the vinaigrette. This reminds me I wanted to try to do something for Passover. There are so many feasts that were celebrated and I’d like to try to incorporate them in my blog from time to time. I saw an Heirloom tomatoes plant, but wasn’t sure about them. Would they be good for canning? I love the different colors! Chris, If you are looking to do something for feasts, check out Catholic Cuisine. Heirloom tomatoes don’t give you a high yield. I would put them in salads and such. If you are looking to make a marinara or tomato sauce, Romas are your best bet. You need to be careful, sometimes they get a disease called bottom end rot. Last year I lost half my Romas to that. I totally love beefsteak and they go well with everything. Especially two pieces of bread! Dear Veronica, The salad looks delicious and the crispy goat cheese is something I would love to try.